The limits of life are an illusion. This list is not a definitive TOP TEN, it is simply ten very disgusting examples of nuclear warfare against the citizens of this world. CV News is attempting to compile a top twenty list, help us out by submitting your “most radioactive” links here. 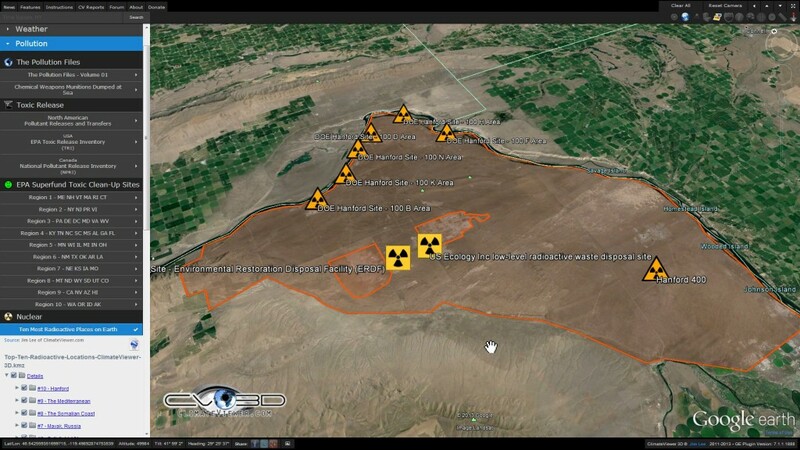 More news on radioactive waste can be found on our RadChick Radiation Research and Mitigation page. 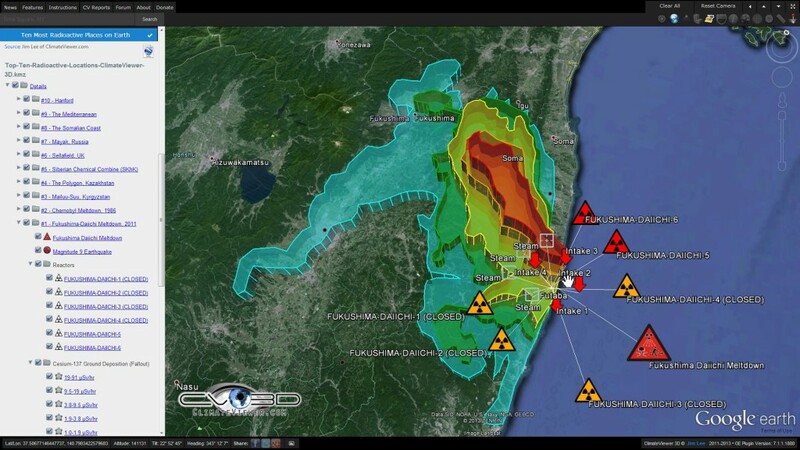 While the 2011 earthquake and worries surrounding Fukushima have brought the threat of radioactivity back into the public consciousness, many people still don’t realize that radioactive contamination is a worldwide danger. 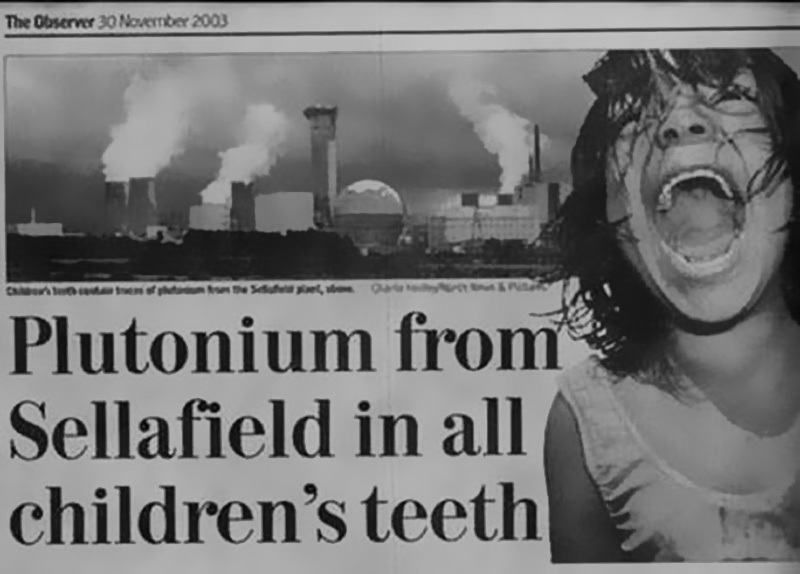 Radionuclides are in the top six toxic threats as listed in the 2010 report by The Blacksmith Institute, an NGO dedicated to tackling pollution. You might be surprised by the locations of some of the world’s most radioactive places — and thus the number of people living in fear of the effects radiation could have on them and their children. The Hanford Site, in Washington, was an integral part of the US atomic bomb project, manufacturing plutonium for the first nuclear bomb and “Fat Man,” used at Nagasaki. As the Cold War waged on, it ramped up production, supplying plutonium for most of America’s 60,000 nuclear weapons. Although decommissioned, it still holds two thirds of the volume of the country’s high-level radioactive waste — about 53 million gallons of liquid waste, 25 million cubic feet of solid waste and 200 square miles of contaminated groundwater underneath the area, making it the most contaminated site in the US. The environmental devastation of this area makes it clear that the threat of radioactivity is not simply something that will arrive in a missile attack, but could be lurking in the heart of your own country. 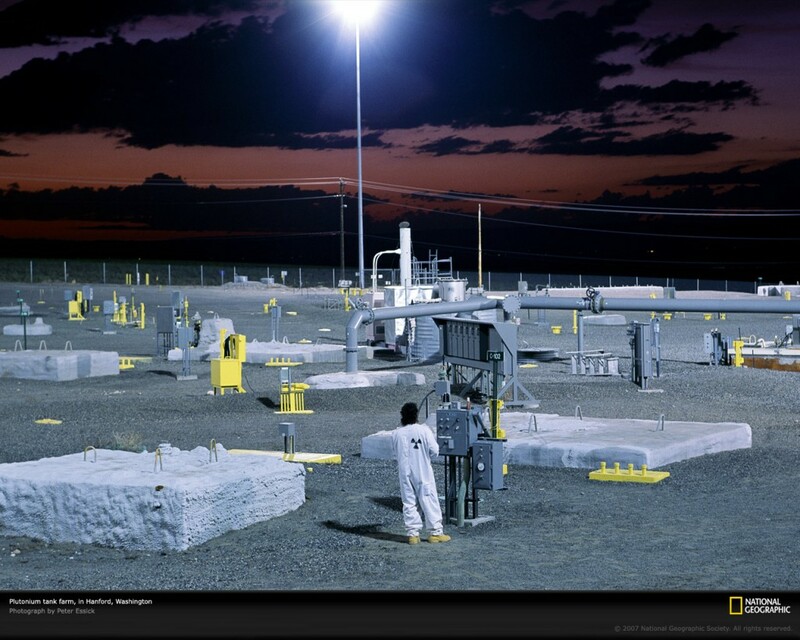 More information available at the Hanford Site, Department of Energy website. HAZMAT in USA on Wednesday, 10 August, 2011 at 03:13 (03:13 AM) UTC. HAZMAT in USA on Tuesday, 14 February, 2012 at 04:14 (04:14 AM) UTC. HAZMAT in USA on Wednesday, 22 August, 2012 at 03:18 (03:18 AM) UTC. Environment Pollution in USA on Tuesday, 11 September, 2012 at 03:17 (03:17 AM) UTC. Environment Pollution in USA on Tuesday, 23 October, 2012 at 16:09 (04:09 PM) UTC. 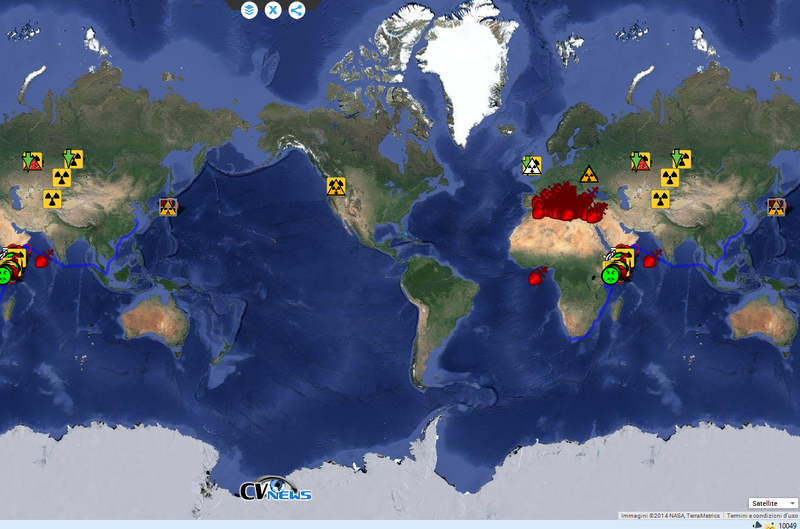 HAZMAT in USA on Tuesday, 08 January, 2013 at 08:18 (08:18 AM) UTC. 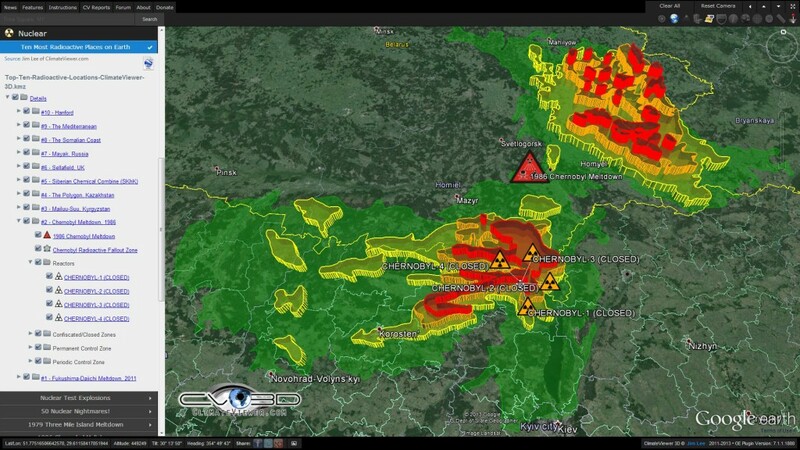 HAZMAT in USA on Saturday, 22 June, 2013 at 04:33 (04:33 AM) UTC. 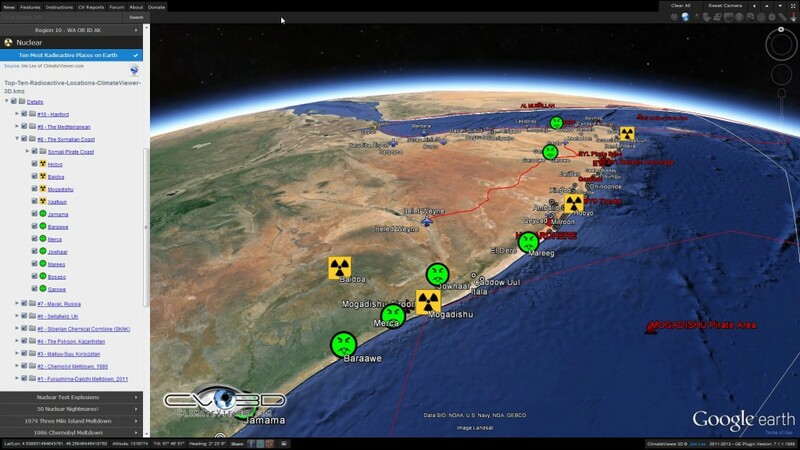 Nuclear Event in USA on Friday, 23 August, 2013 at 15:22 (03:22 PM) UTC. For years, there have been allegations that the ‘Ndrangheta syndicate of the Italian mafia has been using the seas as a convenient location in which to dump hazardous waste — including radioactive waste — charging for the service and pocketing the profits. 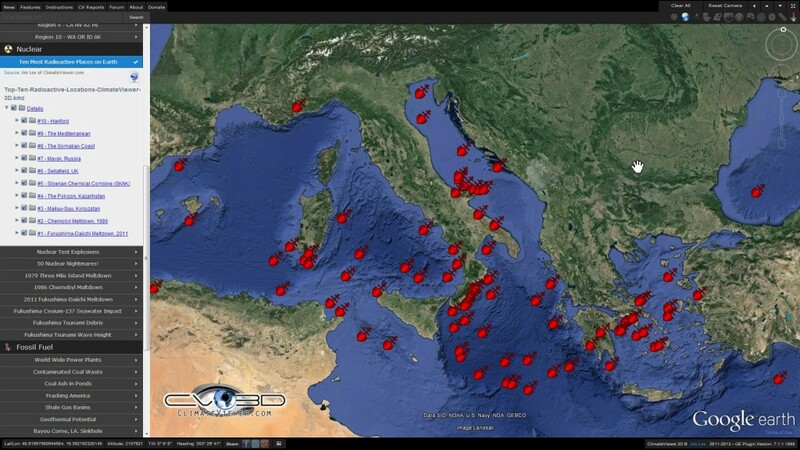 An Italian NGO, Legambiente, suspects that about 40 ships loaded with toxic and radioactive waste have disappeared in Mediterranean waters since 1994. If true, these allegations paint a worrying picture of an unknown amount of nuclear waste in the Mediterranean whose true danger will only become clear when the hundreds of barrels degrade or somehow otherwise break open. The beauty of the Mediterranean Sea may well be concealing an environmental catastrophe in the making. The Italian mafia organization just mentioned has not just stayed in its own region when it comes to this sinister business. There are also allegations that Somalian waters and soil, unprotected by government, have been used for the sinking or burial of nuclear waste and toxic metals — including 600 barrels of toxic and nuclear waste, as well as radioactive hospital waste. Indeed, the United Nations’ Environment Program believes that the rusting barrels of waste washed up on the Somalian coastline during the 2004 Tsunami were dumped as far back as the 1990s. The country is already an anarchic wasteland, and the effects of this waste on the impoverished population could be as bad if not worse than what they have already experienced. The industrial complex of Mayak, in Russia’s north-east, has had a nuclear plant for decades, and in 1957 was the site of one of the world’s worst nuclear accidents. 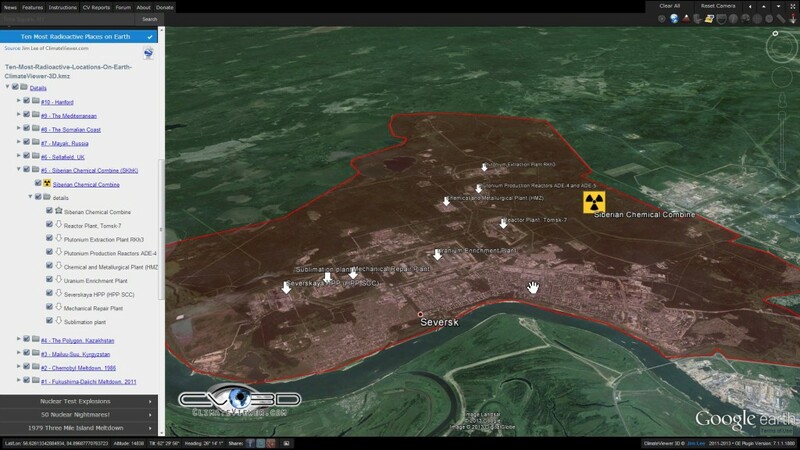 Up to 100 tons of radioactive waste were released by an explosion, contaminating a massive area. The explosion was kept under wraps until the 1980s. Starting in the 1950s, waste from the plant was dumped in the surrounding area and into Lake Karachay. This has led to contamination of the water supply that thousands rely on daily. 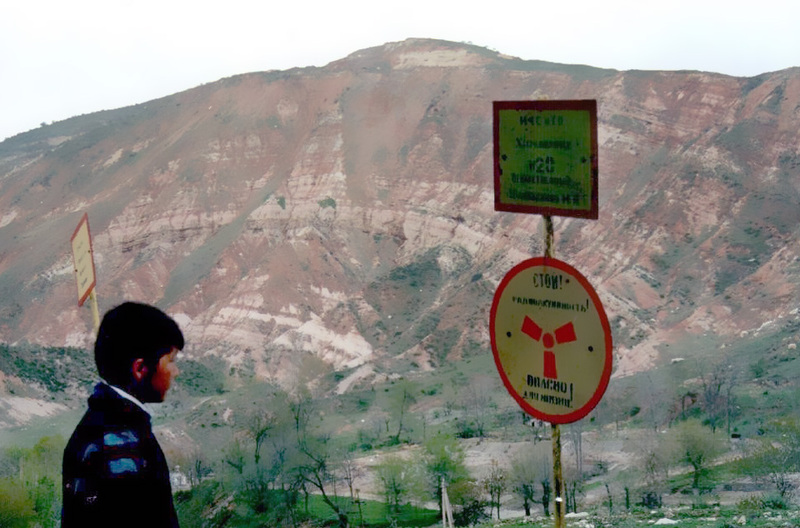 Experts believe that Karachay may be the most radioactive place in the world, and over 400,000 people have been exposed to radiation from the plant as a result of the various serious incidents that have occurred — including fires and deadly dust storms. The natural beauty of Lake Karachay belies its deadly pollutants, with the radiation levels where radioactive waste flows into its waters enough to give a man a fatal dose within an hour. 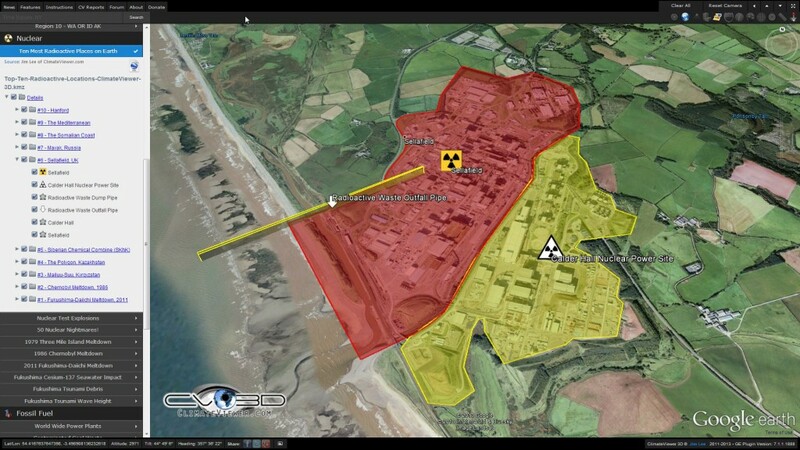 Located on the west coast of England, Sellafield was originally a plutonium production facility for nuclear bombs, but then moved into commercial territory. Since the start of its operation, hundreds of accidents have occurred at the plant, and around two thirds of the buildings themselves are now classified as nuclear waste. The plant releases some 8 million liters of contaminated waste into the sea on a daily basis, making the Irish Sea the most radioactive sea in the world. England is known for its green fields and rolling landscapes, but nestled in the heart of this industrialized nation is a toxic, accident-prone facility, spewing dangerous waste into the oceans of the world. Mayak is not the only contaminated site in Russia; Siberia is home to a chemical facility that contains over four decades’ worth of nuclear waste. Liquid waste is stored in uncovered pools and poorly maintained containers hold over 125,000 tons of solid waste, while underground storage has the potential to leak to groundwater. Wind and rain have spread the contamination to wildlife and the surrounding area. And various minor accidents have led to plutonium going missing and explosions spreading radiation. While the snowy landscape may look pristine and immaculate, the facts make clear the true level of pollution to be found here. 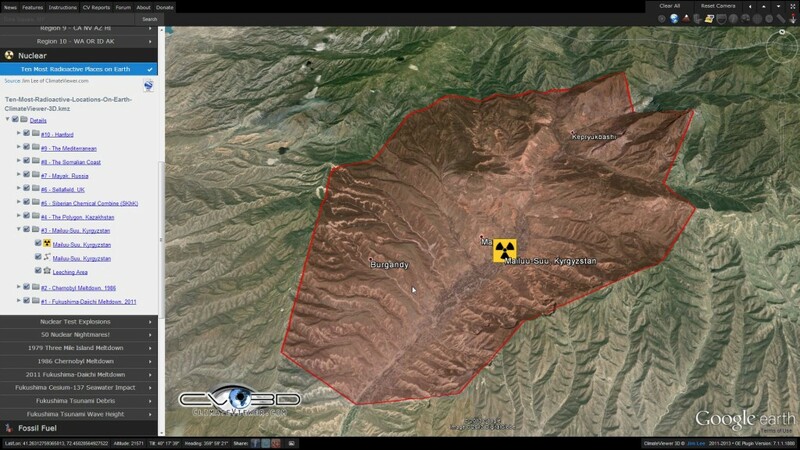 Once the location for the Soviet Union’s nuclear weapons testing, this area is now part of modern-day Kazakhstan. The site was earmarked for the Soviet atomic bomb project due to its “uninhabited” status — despite the fact that 700,000 people lived in the area. The facility was where the USSR detonated its first nuclear bomb and is the record-holder for the place with the largest concentration of nuclear explosions in the world: 456 tests over 40 years from 1949 to 1989. While the testing carried out at the facility — and its impact in terms of radiation exposure — were kept under wraps by the Soviets until the facility closed in 1991, scientists estimate that 200,000 people have had their health directly affected by the radiation. The desire to destroy foreign nations has led to the specter of nuclear contamination hanging over the heads of those who were once citizens of the USSR. Considered one of the top ten most polluted sites on Earth by the 2006 Blacksmith Institute report, the radiation at Mailuu-Suu comes not from nuclear bombs or power plants, but from mining for the materials needed in the processes they entail. The area was home to a uranium mining and processing facility and is now left with 36 dumps of uranium waste — over 1.96 million cubic meters. The region is also prone to seismic activity, and any disruption of the containment could expose the material or cause some of the waste to fall into rivers, contaminating water used by hundreds of thousands of people. These people may not ever suffer the perils of nuclear attack, but nonetheless they have good reason to live in fear of radioactive fallout every time the earth shakes. Home to one of the world’s worst and most infamous nuclear accidents, Chernobyl is still heavily contaminated, despite the fact that a small number of people are now allowed into the area for a limited amount of time. 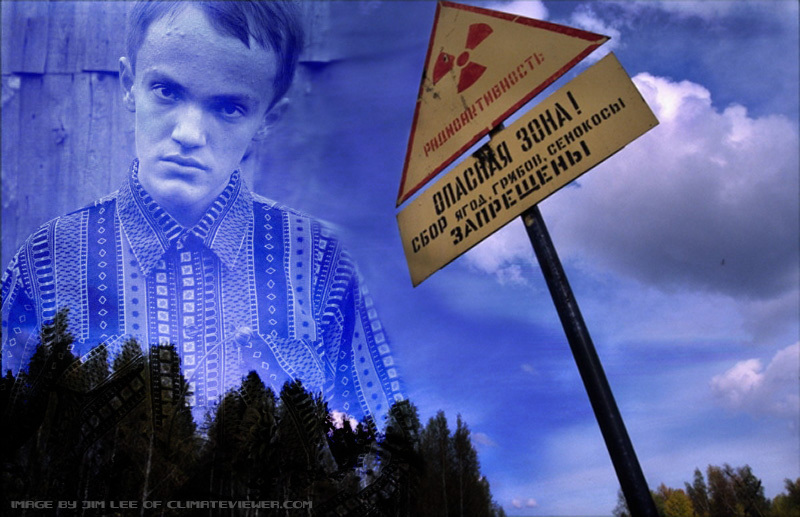 The notorious accident caused over 6 million people to be exposed to radiation, and estimates as to the number of deaths that will eventually occur due to the Chernobyl accident range from 4,000 to as high as 93,000. 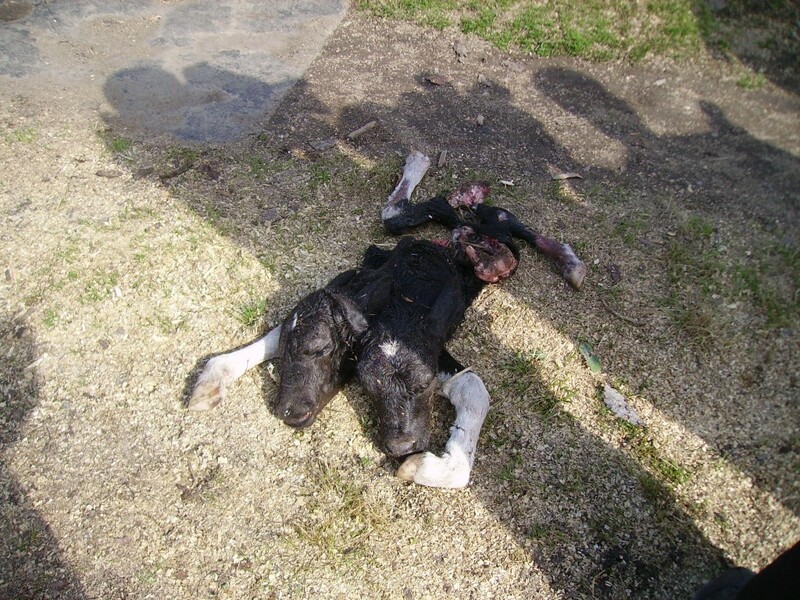 The accident released 100 times more radiation than the Nagasaki and Hiroshima bombs. Belarus absorbed 70 percent of the radiation, and its citizens have been dealing with increased cancer incidence ever since. 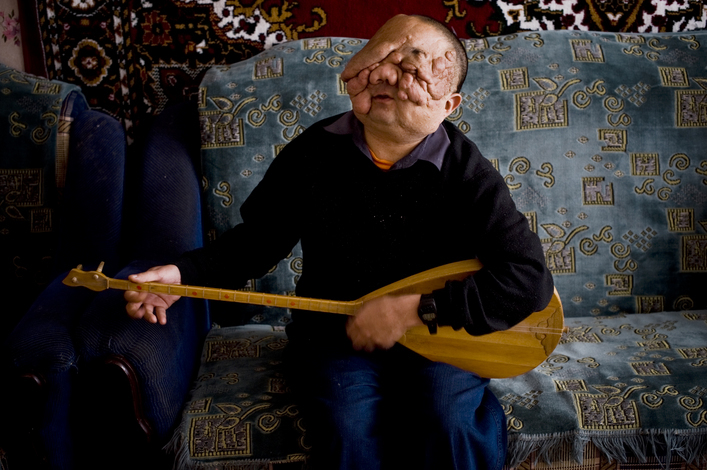 Even today, the word Chernobyl conjures up horrifying images of human suffering. 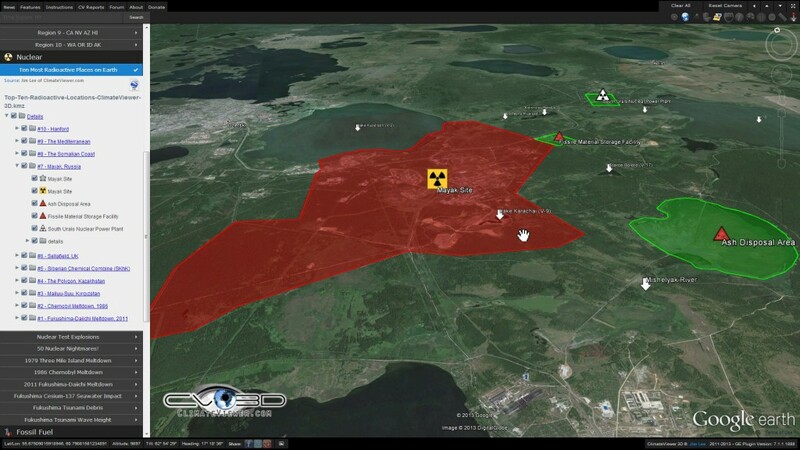 The Exclusion Zone covers an area of approximately 2,600 km2 in Ukraine immediately surrounding the Chernobyl nuclear power plant where radioactive contamination from fallout is highest and public access and inhabitation are restricted. The 2011 earthquake and tsunami was a tragedy that destroyed homes and lives, but the effects of the Fukushima nuclear power plant may be the most long-lasting danger. 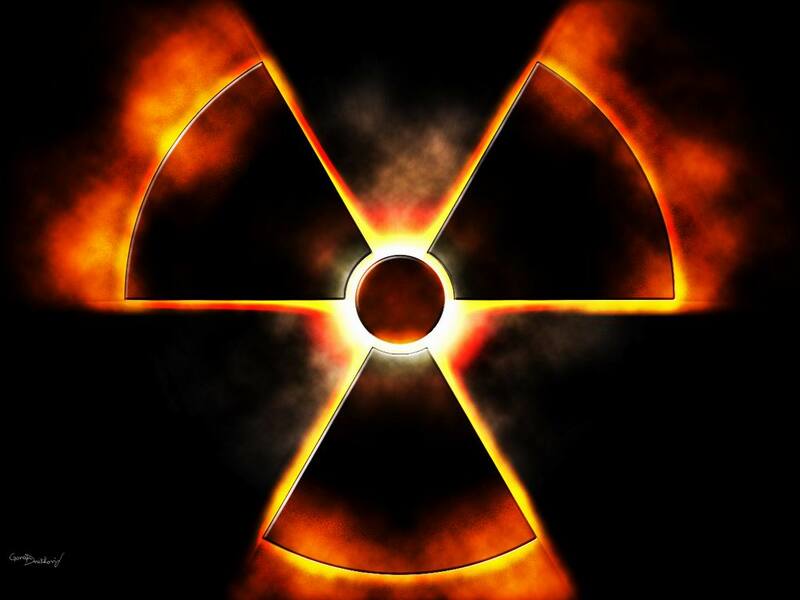 The worst nuclear accident since Chernobyl, the incident caused meltdown of three of the six reactors, leaking radiation into the surrounding area and the sea, such that radiative material has been detected as far as 200 miles from the plant. As the incident and its ramifications are still unfolding, the true scale of the environmental impact is still unknown. The world may still be feeling the effects of this disaster for generations to come. with images, links, and maps by Jim Lee of ClimateViewer News. Decoded! AI cracks the Voynich Manuscript: It’s Mostly Hebrew!